These informative sessions will increase your teaching repertoire. Increase your earning potential. Recognized as the gold standard in the industry, our workshops are designed for Pilates instructors and fitness professionals alike. All workshops qualify for STOTT PILATES Continuing Education credits and carry no prerequisites. 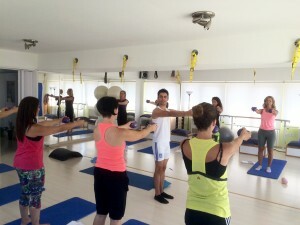 Develop your skills with innovative STOTT PILATES programming at PILATES bodyharmony™, the STOTT PILATES Licensed Training Center in Cyprus. Learn to use the Vertical Frame on any model of STOTT PILATES® Reformer to replicate a selection of Essential-level exercises traditionally performed on the Cadillac. Explore how the Roll-Down Bar, Push-Thru Bar, Arm and Leg Springs can add variety while targeting individual muscle groups and patterns. Discover how a wide range of exercises can be programmed into a full Vertical Frame workout or used as a complement to any Reformer or Matwork routine. This hands-on workshop, developed by the Merrithew™ team, outlines the importance of postural analysis in programming STOTT PILATES® workouts. Discuss the differences between static and dynamic posture and consider how each affects exercise choices and modifications necessary. Review postural theory relating to the effect of certain postures on muscle length and strength and actively practice postural analysis. Developed by the Merrithew™ team, this workshop teaches unique sequences and interesting combinations which are further augmented with the sprung-steel ring. Focusing on stabilization of the shoulders, hips and core, these moves can be added into any personal training or group fitness setting to bring increased intensity and muscle-specific training. Learn how this simple tool can help you achieve dramatic results when used in a variety of applications. Clients with osteoporosis face genuine issues when looking for a suitable exercise program. This specially-designed workout, developed by the Merrithew™ team, shares programming ideas using a Mat and small props, taking into account the different forms of the condition and how they will affect your client. Use the biomechanical foundation of STOTT PILATES to discover how to create effective programs that address the specific needs of this population. Explore how balance and resistance props can effectively assist clients and offer myriad modifications and variations to a Matwork routine. This workshop provides instructors tools to incorporate new fascial research concepts within the body of the STOTT PILATES Essential Matwork repertoire. Following the Essential Matwork order, participants explore how exercise essences can be enhanced with new fascial research concepts, inspiring a new movement experience. Created by the experts at Merrithew™, discover seamless movement flowing exercise sequences that take the body through multiple planes of movement. This workshop will spark creativity in programming and allow participants to tap into their innate body wisdom to find alternate variations that best suit their movement potential on any given day.